Entering into the third year of the annual event, the Thanks giving weekend Copper Classic has increasingly drawn heavy hitters to compete in the racing weekend at the high speed desert facility. 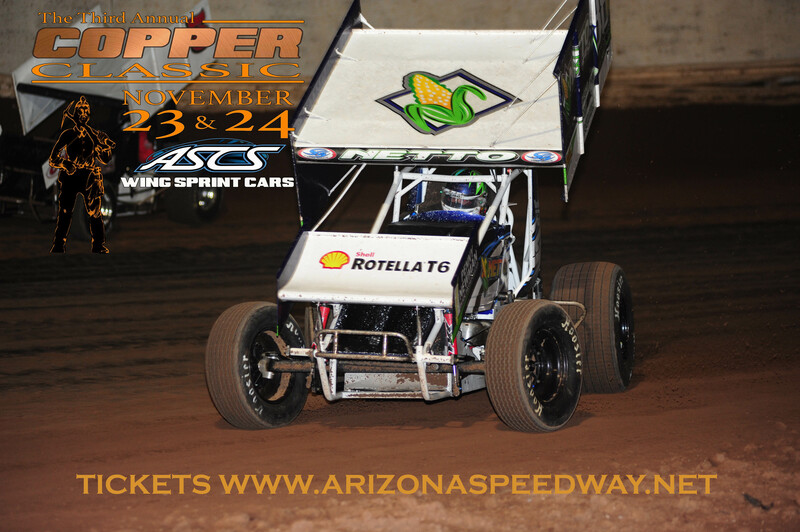 While the rest of the country falls victim to frigid conditions, past Copper Classic's have attracted wing sprint car stars such as Christopher Bell, Justin Sanders, Colby Copeland, Giovanni and Dominic Scelzi, along with the South West's top talent including (but not limited to) reigning ASCS regional champ Colton Hardy, 9 time champ Rick Ziehl, Jesse Baker, Josh Shipley and inaugural Friday feature winner Billy Chester. With the stout field of talent the past two years, Hanford California's D.J. Netto has claimed both the 2016 and 2017 $5000 to win Saturday night Championships and label himself as defending Copper Classic Champion. Both Christopher Bell and Billy Chester have each won $2000 Friday night preliminary features. Racing begins both Friday and Saturday nights, Nov 23 and 24 at 6:30pm. Qualifying begins at 5:50pm both nights. Tickets are available at the gate beginning at 3:00pm both nights of the show and advanced tickets are available online until 11:00pm Thursday Nov. 22. Tickets are $20 for Friday and $25 for Saturday, pit passes are $35. Pits open at 1:00pm both days with fan gates opening at 3:00pm both days. Arizona Speedway is located within ET Motopark at 48700 N Ironwood Dr. San Tan Valley, AZ 85140 5 miles south of US60 on Ironwood Dr.. Call the hotline or logon to www.ArizonaSpeedway.net for more info. 480-926-6688 . Follow us at www.Facebook.com/ArizonaSpeedway .